I don't suppose it will really matter if the 55.4% of votes supposedly giving Montenegro independence in this weekend's referendum are confirmed to be fair and square - the separatists have already declared victory, and the imperial media have already joined them in congratulations. I guess the world is safe, the global peril of Yugoslavia won't bother anyone any more. Then again, even the New York Times notes that the "diaspora" from Brooklyn (i.e. Gusinje) may have been the deciding factor. It is buried down towards the bottom of the article, but it is there nonetheless. Something the NYT did not mention, however, is that while every pro-separatist "Montenegrin" was registered as a voter in the run-up to the referendum, tens of thousands who lived in Serbia were excluded from voting. Three photographs came to me today (I have no idea who took them, when and where, so if anyone does, let me know). They show, beyond any doubt, that in addition to Serbs from Montenegro who backed secession for whatever reason, separatist voters were also Croats and Albanians. Separatists carrying new flags of Montenegro are joined by a supporter sporting the Croatian flag. 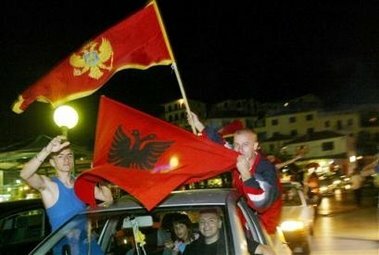 Ethnic Albanians (a large bloc of pro-independence voters) wave Montenegrin and Albanian flags, celebrating secession. I've got nothing against Croats, or Albanians, or Muslims (I won't call them "Bosniaks," that's just silly). But there is something wrong with their votes deciding the fate of Serbs in Montenegro. You see, "Montenegrin," like "Bosnian," is a territorial identity; until it was invented by the Communists, there was no "Montenegrin nation." (See here.) However, in the separatist drive to split from Serbia over the past 8-9 years, they've tried to assert a different language, church, even a completely separate ethnogenesis from the Serbs. The government of Milo Djukanovic has done everything in its power to deny its people their Serb identity. As former Communists who pragmatically switched allegiances to first become "nationalists," then vassals of the Empire, denying their own ethnic identity did not come hard - they never had it to begin with. And now they are in charge of Montenegro, including the 300-odd thousand people who consider themselves ethnic Serbs, and still remember that Njegos, King Nikola and all the other great Montenegrins in history shared that sentiment. "We've already torched them all"
How much is truth worth?